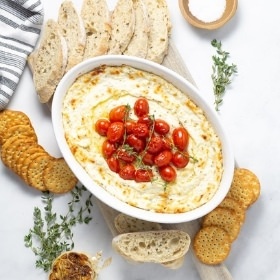 The perfect “make ahead” dip for your next game day party or family get together, this dip bakes in just 20 minutes and has only 9 ingredients. Slice the top off of each head of garlic. Drizzle cut size of each head with 1 teaspoon olive oil and season with salt and pepper. Place cut side down on a baking sheet. Allow garlic to cool until you are able to touch it. Add goat cheese, Parmesan and milk to a medium bowl. Squeeze cloves of garlic into the bowl and stir to combine all ingredients together. Season to taste with salt and pepper. Lightly oil a small baking dish with 1 teaspoon of olive oil. Then spread goat cheese mixture in an even layer in the baking dish. Top goat cheese mixture with tomatoes, then drizzle tomatoes with remaining teaspoon olive oil and season with salt and pepper. Bake for 20 minutes. Then broil for 1-2 minutes to brown the top. Garnish with a drizzle of olive oil and fresh thyme if desired. Serve warm with sliced French bread and crackers. Don’t be afraid of the garlic. Two heads of garlic sounds like a lot but I promise, it’s not. The roasting process really mellows the flavor of the garlic. Honestly if you love garlic as much as I do, you even could go ahead and add three heads of garlic! Use a log of goat cheese (as opposed to pre-crumbled goat cheese). I prefer to use a log of goat cheese in this recipe as it seems to melt better and gives the dip a smooth and creamy texture. Don’t skip the tomatoes. The tomatoes might seem like a garnish, but they truly are a vital part of this delicious dip. They add a delicious freshness and nice texture to the dish. Season, season, season. This dip is very simple. The ingredient list is short. Moderate amounts of salt and pepper will go a long way to boost the flavors of this dip. Don’t be afraid to use them!